This Blog was authored by EJ Bodnar, Senior Product Marketing Manager at Nutanix. Nutanix is excited to announce that the leading Enterprise Cloud Software is now available on the most widely deployed Enterprise Server Platform. HPE ProLiant servers are fully tested and certified by Nutanix to run Nutanix Enterprise Cloud software. HPE customers are able to leverage Nutanix solutions to build an enterprise cloud delivering the simplicity and agility of public cloud services, with the control and security needed in private cloud environments. ProLiant customers receive the same Nutanix compute, storage, virtualization and network functionality – plus the company’s intuitive, consumer-grade management that has made Nutanix the industry’s most popular hyperconverged solution. Build a full infrastructure stack with HPE ProLiant servers and Nutanix Enterprise Cloud software. Eliminate expensive and complex SANs and simplify their datacenter using ProLiant server storage resources. Start small and scale their infrastructure without limits by adding ProLiant servers one at a time. Easily add Nutanix Enterprise Cloud software to your ProLiant server with no change to your architecture or operations. Nutanix’s support for HPE ProLiant is in response to strong demand from customers and channel partners. Authorized distributors and resellers for HPE and Nutanix will integrate the HPE hardware and Nutanix software either at their facilities or at the customer site. IT professionals get the same delightful experience as all the other Nutanix-supported hardware platforms. ProLiant DL360-G9 is a 1U rack server that offers up to 8 small form factor (SFF) drive bays. This alternative allows for an all-flash configuration or a hybrid option consisting of 2x SSD and up to 6x HDD’s. The DL360 is an excellent fit for VDI, middleware, web services and general server virtualization use cases. ProLiant DL380-G9 12LFF is a 2U rack server that offers up to 12 large form factor (LFF) drive bays. Available in all-flash or hybrid configuration this alternative allows for 2x SSD and up to 10x HDD’s. Primarily targeting storage heavy and server virtualization workloads. ProLiant DL380-G9 24SFF is a 2U rack server that also offers up to 24 SFF drive bays. This alternative is available in either all-flash or a hybrid option consisting of 4x SSD and up to 20x HDD’s. Best suited for MS Exchange, SQL and large database use cases. Nutanix will accept first call for support for any qualified HPE ProLiant systems deploying its Enterprise Cloud solution. This provides a simple, single point of contact for all support requests. Customers always have the option to call HPE first for obvious hardware issues. Upon initial triage, if it is determined the problem lies with the hardware, Nutanix Support will assist the customer to engage with HPE through a warm handoff, providing all the necessary and relevant information. Nutanix can also engage directly with HPE on the customer’s behalf via TSANet (TSANet.org) as an option. If it is determined the problem lies with the software, Nutanix Support will drive the issue to resolution. In either case, Nutanix Support will close a case only when an acceptable resolution has been reached with the consent of the customer. Hyperconverged Infrastructure can bring radical simplicity to private clouds. However it takes much more to build an enterprise datacenter with the power of public cloud. 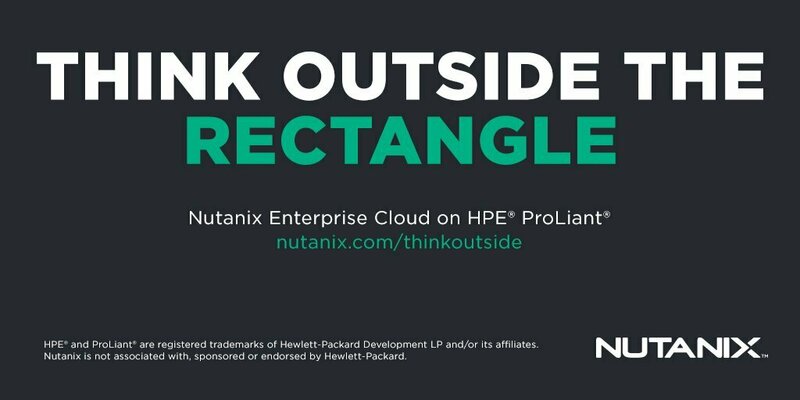 Nutanix Enterprise Cloud Platform running on HPE ProLiant combines the agility and one-click simplicity of public cloud infrastructure with security, control, predictable economics and the performance you need from a private cloud. Go beyond Hyperconverged Infrastructure with Nutanix Enterprise Cloud. HPE and ProLiant are registered trademarks of Hewlett-Packard Development LP and/or its affiliates. Nutanix is not associated with, sponsored or endorsed by Hewlett-Packard.